THE HAGUE, Oct. 16 ,China and the Netherlands agreed to enhance exchanges and cooperation between the two legislative bodies for the further development of the two countries' relations. 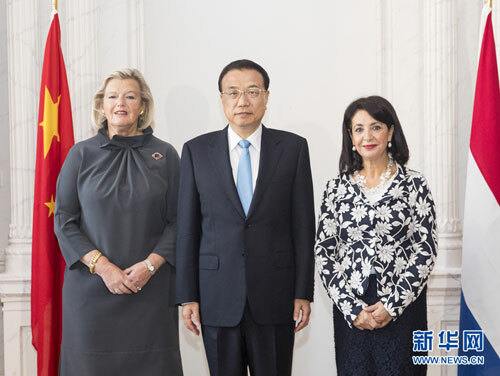 Interactions between the two legislative bodies serve as an important part of China-Netherlands ties, Chinese Premier Li Keqiang said when meeting with Ankie Broekers-Knol, president of the Senate, and Khadija Arib, president of the House of Representative of the Netherlands here on Tuesday. He hoped the two legislative bodies will give full play to their role as representatives of public opinion and a bridge between the two peoples to forge a more solid public foundation for closer cooperation and ties based on the principle of mutual respect and treating each other as equals. Chinese President Xi Jinping and Dutch King Willem-Alexander exchanged visits in recent years, Li said, adding that the two countries have witnessed close exchanges between governments and legislative bodies and enjoyed fruitful results from cooperation in various fields. China is willing to work with the Netherlands to reinforce communication and consultation over global affairs and jointly safeguard multilateralism and free trade, Li said. The parliamentary leaders welcome Li's visit, saying that the Netherlands is one of the first western countries to recognize the establishment of new China. Highlighting the frequent high-level exchanges and the close economic ties between China and the Netherlands, they said the two countries' practical cooperation scores continuous achievements. The Dutch parliament highly values the two countries' relations, they said, noting that it is willing to strengthen exchanges with the Chinese legislative body and continue to play a constructive role in the healthy and stable development of Netherlands-China ties.